including sizing for garments, description of any special fiber treatment you would like. 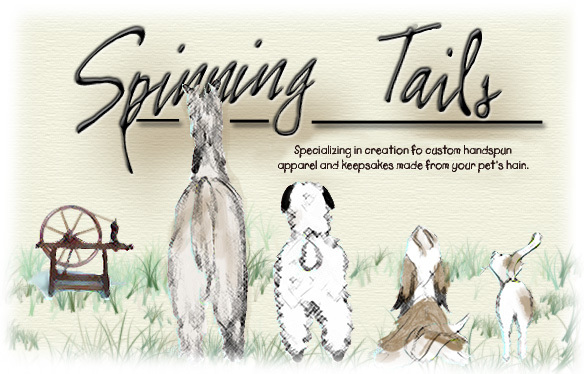 Disclaimer: spinningtails.com and Lisa Butler provide handspinning and related services for pet fur products. Since each animal is different, there is no guarantee that I will be able to provide useable yarn from your animals hair. If I am unable to work with your animals hair, I will refund any down payment to you, but will not return the animal hair unless you request that I ship it at your expense. Since each item is custom made, there is no guarantee that your product will look exactly like the photos shown in this web site, and you should be aware that there are natural variations in any handmade product. I will do my best to produce a product that satisfies you and conforms to reasonable prevailing standards in the industry. When mailing please insure for the value you think appropriate to protect against loss in mail. Thank you.